MiniMaxed, our Minimax update is now available. The design in very much like the original, but updated for stitch and glue construction. For information, see below. This WebLetter is devoted to the Glen-L canoe and kayak designs. I had hoped to have more feedback, but... We do have some new photos and email that have been included. If anyone would like to send pictures or comments about their canoe or kayak project, we will add them to future WebLetters. There are many links in this WebLetter that lead to pages in our on-line catalog. The "Back" or "Return" links do not bring you back to this WebLetter, but to the Boat Design Catalog index. To return to the WebLetter you will have to use the "Back" button on your browser. So much is added to the Web Site on a daily basis, that I can no longer keep track. The Project Registry is added to almost daily. Customer Photos gets new or additions to existing photos several times a week. We have added several new "Notes" pages to the Boat Design Catalog design pages. These pages contain misc information or drawings about the design, usually in answer to inquiries from builders. There have also been numerous additions and explanations to existing pages all over the site. As always we ask you to share your boatbuilding experiences with your fellow builders. I would like very much to put your story in the next WebLetter. This issue we are featuring Glen-L canoes and kayaks. These designs use a variety of different construction materials. For those who are not familiar with our canoes and kayaks, we would like to introduce you to some of our most popular designs. These are frequent first projects and because of the variety of construction methods, they allow builders to get experience in these methods before tackling larger projects. There are links to the catalog page for more information on each design. Use the back button to return to this WebLetter. Designed for sheet plywood over frames. The Sea Kayak TwoCatalog page. Designed for stitch and glue plywood using either 4mm or 1/4" plywood. My SeaKayakTwo is finished and I really like it. Do you need somepictures ? Designed for strips of wood and fiberglass. Designed for stitch and glue plywood. The Rob Roy Catalog page. Designed for stitch and glue plywood construction using 4mm okoume. Designed for stitch and glue plywood using 4mm or 1/4" plywood. Designed for cold-molded wood veneer to form a "molded plywood" boat or for C-Flex, one-off fiberglass construction. CHIPPEWA 15' veneer (baltic birch plywood) / Jeff &Tom Mills /> 5-26-00: We have constructed the skeleton and are about to put the strips diagonally on the boat. 7-15-00: We've finished the first layer of veneer strips. Starting on the second layer. Can't wait to get it in the water. There was a lot to learn about trimming each strip for a smooth fit. 8-5-00: Finished second skin of plywood veneer. Now to start pulling hundreds of staples out of the second layer. Started on Seats, one is finished, need to cane the second. Pumps on the epoxy bottles were worth every penny. A "Must Have" item. 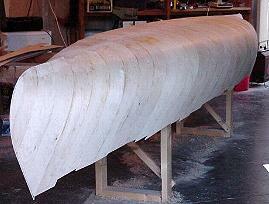 8-20-00: started with the fiberglass. Messier than baking cookies with a two-year-old. 7-10-01: Finished with inside fiberglass, gunwales, seats and thwarts July 7, 2001. Launched on July 9 at Palo, Iowa. Photos posted on web site. Very proud of our accomplishment! A nice looking canoe. Acommon question is "how much weight will she hold?" This especially applies to smaller boats such as canoes or kayaks. The following will give a rough idea of the displacement of a typical double ended craft such as a kayak or canoe. It will not be accurate with boats that have a transom. D = draft . Estimate draft at the widest point of the boat or approximate midpoint; usually about 3" - 6" on the typical canoe / kayak. B = maximum beam at bottom. If round bottom measure width about 3" above keel. L = waterline length or length chine point to chine point fore and aft measured along the centerline of the boat. Disp. = displacement, weight of everything on board plus boat weight. To find the displacement at the estimated waterline use the following formula. .6D x B x L x 62 = Displacement in pounds, fresh water. .6 x .5 x 1.67 x 17 x 62 = 528 lbs. fresh water displacement. But let's say we know the total weight to be carried, boat weight, passengers and gear, in other words displacement: but how far will the boat sink in the water? Suppose we have a displacement of 450 lbs. Using the kayak example above the formula is altered to solve for draft. Are the formulae accurate? No, but close enough for estimates. Basically it calculates the underwater volume and converts with a factor (.6) derived from a group of kayaks whose characteristics had been calculated. Be practical when you consider load carrying ability. Many people, however, are not. They want a small kayak that will carry two full blown adults with lots of gear. Don't expect to load the boat so there are only a couple of inches of freeboard. Some even want to carry several passengers in a 12' kayak. Use a string to simulate the boat outline on the living room floor. Sit the passengers contemplated in the outline and you will readily see if what you desire is practical. * Convert inches to feet by dividing by 12. This fun boat is a takeoff from an original design circa 1960 by William Jackson called MINIMAX that was published and re-published in boating "handbooks" of the period. Probably more of these boats were built than virtually any similar craft. Over the years GLEN-L has received numerous requests for plans for the boat. People who had one when they were young remember the fun they had and now want to build one for their kids or grandkids. The design has been altered to handle current motors and to utilize modern materials, primarily Stitch-N-Glue construction methods. But essentially it is MINIMAX revisited. In Canada, this type of boat is commonly refered to as a Sea Flea. Other boats that might fit in this category: XP8, Tiny Titan, Super Spartan, TNT, Tunnel Mite. See: Boat Design Catalog/Outboards for more information. For the details about our MiniMaxed, click here. One of the most common questions asked by the new boatbuilder is what tools are needed to build a given boat. The hard part of answering the question lies in the fact that actually very few tools are absolutely required, but there IS a definite trade-off of time versus having the right tool for the particular task at hand. In addition, there is also a trade-off of material cost versus having access to the larger tools to do the lumber milling tasks such as planing, or ripping planking strips. As the scope of the project increases, so will your inventory of tools appropriately. At the extremes, think of a strip planked canoe with precut station frames and pre-cut cove and bead strips versus a 50 foot sailboat that started with a pile of logs and plywood. 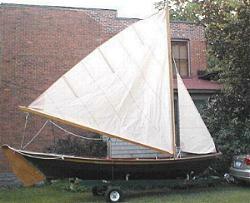 To finish the sailboat, and still live long enough to enjoy it, requires a substantial investment in tools and shop. Conversely, I have heard of guys doing a canoe in the living room with only a few hand tools (generally as a college student). So, to answer the initial question, I will try to list the tools I reach for consistently for every project and go from there. Additionally, I will start with hand tools, as power tools supplement, but do not replace hand tools. This year marks the 25th Annual Wooden Boat Festival. Join the celebration of the Silver Jubilee, September 7th, 8th, & 9th, 2001. Visit their site for a preview of what's to come and get acquainted with the dates, events and travel accommodations. For the anniversary, they have revived the original companion event, the "Symposium on Wooden Boatbuilding", September 1 - 6, 2001, with workshops and a special lecture/roundtable series. Learn more about the festival at www.woodenboat.org. There was an email about the Ski King in WebLetter 27. Although the design has not been in our catalog for several years we added a Ski King page to the Misc pages and... several copies have been sold. There is definitely an interest in "classic" designs. How's your Glen-L classic coming along? Unfortunately, because of lots of rain preventing me from finishing the paint work, Jack Tar's launch is delayed until early spring of 2002. That said, she looks great. The solid mahogany side rails and posts are in place, with the addition of 4 inch sisle rope as a fender, plenty of photographs are on their way for the archives. Just for your info, my work hour log building Jack Tar has almost reached 10,000 Hours over almost six years this September; it would be interesting to know when Glen drew up the design for the Jack Tar, if he calculated, if that is possible, the time ratio say based on working mostly weekends. This is just a thought, not a criticism, because I have enjoyed every single minute. My wife even now has to drag me away to stop for lunch. Also I am not a good example, because this is a boat I never would have dreamed to have owned so I have taken my time through every stage of construction, with the thoughts of measure three times, cut once. Keep up the good work, I will be in touch. Also see WebLetters19 and 21 and Customer Photos . Darla saw this message re. the Alpha 2 in an AOL news group. Evidently the guys were impressed that a woman had built it. One even offered marriage, based on her boatbuilding prowess. We, of course, have known for a long time that women are every bit as good at building boats as male builders. Wow! 7 months later and I'm done!! Can't believe it. And it came out better than I imagined it would. It's a very pretty shape. Many thanks to all the posters here. I didn't post all that much being a rank beginner (next I'm going to learn how to sail!) but I certainly learned a ton in the last few months. Just found your site and had to see if you still had a boat I had built from your plans back in 1960-61. I found the Sea Knight which looks very much like the one I built. The boat was kept in Miami and I, with my wife and two children, had a wonderful time cruising the Bahamas; the Florida Keys from Miami to Key West; the Florida coast from Miami to Jacksonville; and a cruise from Miami north then through Lake O to the west coast and then south to circle the tip of Florida. Want to thank you for your plans and the joys you have given us. I built the Pee-Wee as a summer project while I was in high school in 1963. It came out great and was easy to construct. I fiberglassed the hull, painted it white with blue epoxy metal flake trim, and installed a steering wheel, deck fittings, and running lights. It ran great with a Johnson 15 horsepower outboard. One of the most fun projects that I've ever done. Subject: Re: do you offer any resin that can repair rotting wood? I own (1955) Thistle #874... Apparently, the cover we have been using while the boat is on the trailer has been leaking... This morning, after tipping the trailer back and dumping the water, I found that the heavy center-pieces forward of the mast are wet (soggy, when pushed with a batten) and showing signs of beginning to rot. The exterior is fiber glassed, and everything still appears to be structurally sound. Replacing these very-MAIN pieces would appear to be a huge undertaking. To hopefully bypass this, I am wondering if you might offer any product, such as something from your "POXY" line, that could penetrate deep into dried, porous wood, and then slowly harden, restoring the original strength? Some products say that they will do what you ask. I personally do not have much faith in them. To penetrate, an epoxy would have to be made very thin, with a high percentage of solvents. Even with that, it is not likely to penetrate anything but very porous wood. Because there is a low percentage of solids, I question how much strength is added. If the damage is not structurally threatening, such products may be appropriate; if the structure has been compromised it should be replaced or "sistered". Hi, I was just perusing at greater length the boatbuilder connection and ran across the comments from Ed and a few others, along with responses from Barry, from a few months ago. I just have to add my 2 cents worth...I have had some form of Glen-L catalog around for the last 30 years, and have been talking and thinking about building a boat since I was a kid (45 years ago...). I grew up boating on a large local lake in a wooden inboard built from a kit. For all I know it was a Glen-L too. I thought about building the little hydros, then runabouts, etc, etc. A couple years ago I decided to finally do it, and ordered Sea Knight plans from Glen-L. In the photo archives I now have some pictures of my progress. I am building the boat in a garage with a minimum of tools and very little prior woodworking education and experience. My total woodworking education was 9th grade wood shop. I still have the spice rack I made to prove it. In any case, while I'm sure (as with anything) everyone's experience might not be perfect, I had to write in and say thanks to Glen-L and your staff. I have had orders filled and shipped immediately, and email answered promptly by Barry, Gayle, and Glen himself. I have spoken on the phone with a very pleasant woman who answered more questions I had. I could not have asked for anything more. The fact that my instructions were copies didn't faze me in the least. My Sea Knight was designed in 1956 and I find the "original" style instructions and blueprints to be even better like they are, than "new" or in some electronic format. It goes hand in hand with the "vintage" design of the boat and I wouldn't have it any other way. I have spent many hours looking over my blueprints and find all the information there. The "Boatbuilding with Plywood" book has been the best source of information I can think of. The "How to Fiberglass Boats" video made the job easy. The project has gone very well so far, not without my screw-ups, but that's part of doing it yourself. I guess its all in what you are looking for, but in my opinion Glen-L has done a great job. Keep it up. Just wanted to drop you guys a note of thanks. Last month I realized that the forward sections of my old fishing boat were in very bad rotted condition and needed replacement of the structures below decks in order to support the new decking that I had made. I received an email and a subsequent phone conversation with your tech people concerning the epoxies needed to do the job. As a first time user I was a little apprehensive about doing the job, but I figured that If I didn't fix it I could just as well cut the boat up and throw it out, and the costs of the epoxies were cheaper than new boat payments. Well to make a long story short, I purchased the supplies your people suggested, and everything worked out just fine. In fact I converted the boat from a side console to a center console at the same time. I finished things up just in time for our annual fishing trip to Minnesota. I still have other things that need replacing on the boat, but now I can attack them with more confidence as I have seen how easy it is to use your products. Thanks again for the tech information and great products. That boat is like a rock. I've had it out in some pretty rough water, and it hasn't let a drop in yet. It tends to pound going dead into a chop, but don't they all? 50 HP isn't enough the way I've got it rigged out. I guess 75 is minimum to plane it with 4 aboard. The high sides and cabin tend to make it "sail" in a high wind -- getting it to turn into a wind while pulling a net takes too long, and that's one reason for more power. If doing it again, I would put limber holes through the stringers to make water drain easier so I could wash it out with a hose. I made the floor panels where they will come out in three pieces, but shrimp and fish get trapped between the stringers and have to be "vacuumed out" of each longitudinal space in the bottom. I didn't finish the inner sides (other than paint) to cut cost and weight, but would next time for esthetics and to get a seal with the floor. Bottom line, the V-dory is heavier and stouter than I expected, but is solid as a rock. I don't think twice about carrying the kids in it. Its easy to patch the dings and "pier rash", and it's serving me well. I'm ready to build another one!! I am impressed with Glen L Marine's and Gayle's excellent service in getting this spar shipped and helping me out. I even received two faxes of the shipping docs. Yellow freight has already scheduled the delivery for Thursday. Thanks again. I would gladly recommend Glen-L to others!! Just a quick note to let you know that I have placed my Glen-L Squirt page back on-line.